Art du Pastel en France invites you from May 25 to June 02, 2019. 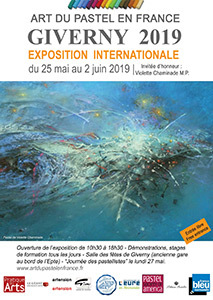 Meet international artists and guest of honor Violette Chaminade at the Giverny exhibition (27). Partners of this annual event, Pastels Girault will be present on the weekend of the opening until Monday painters. You will find all our pastel material and Art Spectrum paper.